Dr Belgi has wide interest and skill in diagnosis and management of skin cancers and Mohs micrographic surgery for treatment of skin cancers. She also has keen interest in management of inflammatory skin conditions, eczema, psoriasis, hair and nail disorders, acne and biological and immunosuppressive therapies. 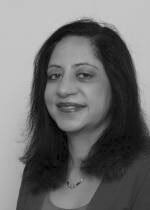 She is a consultant dermatologist at Hampshire Hospitals Foundation Trust. She took her dermatology training at Southampton and Portsmouth (Wessex region). Following this she took an advanced surgical fellowship in Mohs surgery at the prestigious Mohs centre at Portsmouth. Bollywood Dancer, radio Presenter for Unity 101 community radio station, Sundays from 6 to 8 pm on 101.1 FM, yoga, arts and crafts. Studying mechanisms of drug hypersensitivity reactions and developing rapid diagnostic tests for management of drug reactions. Research work has been published in various journals. Dr Geeta Belgi does not hold a share or financial interest in this hospital, another Nuffield Health hospital or the company. Dr Geeta Belgi does not have a share or financial interest in equipment used at this hospital or another Nuffield Health hospital. Dr Geeta Belgi does not hold any paid advisory role(s) at this hospital or on behalf of Nuffield Health.